Coming from just one county west from me, Halestorm is an American rock band fronted by the vivacious and multitalented Lzzy Hale. Hale soars on vocals, but is also versed in piano and guitar. Halestorm may be young, but they're hardly youngsters in the business. The group has been consistently active, writing and performing original music since 1998 releasing several self-produced works. Their self-titled debut is their first full-length for Atlantic Records and produced by Howard Benson. Halestorm might be best described as chick-fronted Nickelback making catchy and heavy modern rock for a notoriously male-dominated audience. They have the swagger, hooks, and presence. Conversely, Lzzy Hale has a more versatile vocal range sounding both streetwise and feminine in the same song; additionally, she doesn't seem to have the anger, bitterness or angst that constantly visits Kroeger and many other vocalists/lyricists these days. Also, there is more diversity in Halestorm's music from straight traditional melodic rock 'It's Not You' to groove-laden alt rock on 'What Were You Expecting' to rock with current metal nuances on 'Nothing To Do With Love.' Following the latter, many of Halestorm's pieces have a strong metal edge to them particularly in the latter half of album, and especially on 'Love Hate Heartbreak' and 'Dirty Work.' On both songs, The riffs, pacing, and guitar solos are as aggressive and vigorous as most any traditional heavy metal. 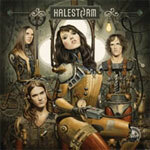 Yet, within all this heaviness, Halestorm settles down for some compelling rock ballads where the significant characteristic is Lzzy Hale's lush and soaring vocals. 'Bet U Wish U Had Me Back' is more on the hard rock side with a thick, layered sound. 'Familiar Taste Of Poison' fits the more traditional rock ballad being softer throughout. The others, 'I'm Not An Angel' and 'Better Sorry Than Safe' straddle between the former two in musical character. Having said all this, Halestorm is essentially straight up leather meets torn jeans aggressive hard rock with sound and enjoyable arrangements, compelling and soaring vocals from Lzzy Hale, and cohesive and blistering musicianship from the rest of the band. If you can ignore the ludicrious album cover art, a great treasure lies within. Highly recommended! Halestorm is essentially straight up leather meets torn jeans aggressive hard rock with solid and enjoyable arrangements, compelling and soaring vocals from Lzzy Hale, and cohesive and blistering musicianship from the rest of the band. If you can ignore the ludicrious album cover art, a great treasure lies within. Highly recommended!